Today is my first day back in London (in 5 years!) and I’m so excited to enjoy the city for over a week. Follow along on Instagram to see what Krystal and I are up to – looking forward to meeting with a bunch of amazing London-based brands, enjoying afternoon teas and shopping on the high streets! If you have any recommendations for while we’re in the city, send me an email or write a comment below. Speaking of our London trip, Blacklane Limousines provided a complimentary transport to the airport and it was such a breeze! The driver couldn’t have been nicer or more helpful – and Krystal and I had a ton of luggage! It’s so nice not having to worry if a cab is going to be on time (are cabs ever reliable anymore?) or worrying about having a creepy UberX driver. I highly recommend checking out Blacklane – the whole experience was exceptional! Blacklane Limousine service is available in 140+ cities worldwide and they offer 9 different luxury vehicle types to fit your needs (from first class sedans like BMW 7-series to Mercedes Viano vans). You can book your trip on their website or via their handy and easy-to-use smartphone app. Genius! Click here to check out Blacklane Limousines. Have you guys checked out OTTE NY’s fall 2014 collection? It’s incredible. We’re talking more amazing fur collars, printed silk dresses, cozy (and long!) sweaters, and more. I already picked up this hat! If you love matching sets, you MUST see this quilted vest and matching short set. I could totally see Serena Van Der Woodsen sporting this set with an oversized sweater and over-the-knee boots! Click here to see and shop more from OTTE NY. I’m so jelly lol but really have fun in London. love your picks as always. have SO much fun in london! Okay, you totally nailed that “Serena” outfit!! She would have totally worn that! I seriously LOVE that matched set. I would love to have those slip ons and turtleneck tee. Have fun in London! Great picks! I especially love that striped turtleneck! You seriously put together the most beautiful collages! Love that turtleneck. That striped turtleneck is the perfect piece for pairing with a camel or black blazer or styled with a chic leather pencil skirt! So timeless and versatile. Have an amazing time in London! Looking forward to reading about all your adventures! Have a blast! I know I just went to Europe, but I already want to go back! 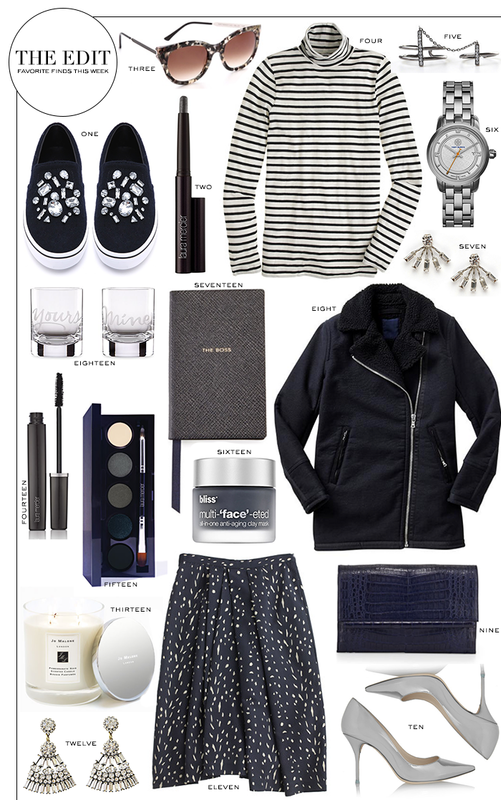 Loving everything way too much, especially the sneakers and striped turtle neck! Perfect picks for a trip to London! I especially love the Jcrew skirt! Have a wonderful trip! Um hi… I need that coat! love this edit! The striped top is pretty!